Some of you may know Zane Matsko from the signature acoustic hip-hop covers that he frequently performs at Penn State open-mic nights, or as an active member in Penn State’s Songwriters’ Club. You may also know Zane as one of the wittiest characters in the twitter-verse, giving us a 140-character look into his hilarious inner-monologue (@manezatsko). But regardless of how much you know Zane, its indispuatable that Zane is one of the most genuine people in State College. 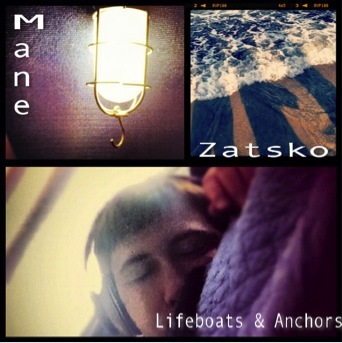 He released his debut album Lifeboats & Anchors under the moniker Mane Zatsko, and the release is a true testament to his talent. If you are looking for the type of album that you can listen to from start to finish while sitting at a coffee shop doing work, walking from class to class or in the alone in the comfort of your room, then this is the right album for you. Zane’s lyrically dynamic acoustic melodies can offer you the type of support a music lover looks for in a favorite song. From the first song “Intro (Wake Me Up)” it is clear that this young songwriter has some serious potential. One of my favorite tracks from this album is “Moments Like These,” a standout track with a chorus that perfectly showcases his vocal and songwriting abilities. Additionally, the title track “Lifeboats & Anchors” is a prime example of Zane’s editing skills. Zane also features the vocal talents of Sara Thornton in his track “Getting Old Fast”. Thornton’s sweet voice compliments Zane’s perfectly as their harmonies serve as a flawless addition to the track. I would recommend downloading Zane’s album to anyone who not only enjoys good local music, but good music in general. Indulge in the acoustic alternative grandeur with lyrics that are nothing short of pure gold. Grace yourself with a collection of tracks by a musician who is not only gifted, but is also genuine. Also, since Zane is a local musician you will able to see him perform these songs sometime this semester, and there is nothing better than being able to see an artist that you fall in love with live. You have nothing to lose by listening to this album because if you ever get lucky enough to be friends with Zane, you will realize that his music is an exact reflection of him: it’s absolutely wonderful.